Study Free NABTEB May/June & November/December [GCE] Past Questions and Answers for Senior Secondary Schools | Practice Free NABTEB Past Questions Online | Attempt Free NABTEB Past Questions and Answers Online. This is to inform all students who registered and wish to sit for the National Business and Technical Examinations Board that they can now practice/attempt the NABTEB Past Questions and Answers online via their Smart Mobile Phones and Computers. The National Business and Technical Examinations Board Launched the WAEC e-Learning Online Portal to assist and guide students in making necessary preparations for their examinations. On this website you will find resources for all NABTEB approved subjects that will help you understand the standards required for success in respective Examinations. The Portal helps to students to practice online free NABTEB past questions. Students who wish to make it in the upcoming NABTEB examinations are therefore advised to make use of the e-Learning Portal to test their skills on their various subjects. 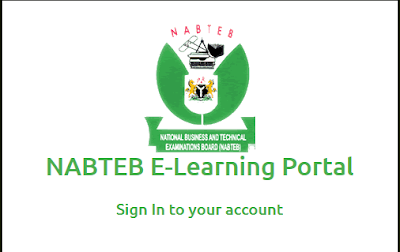 Below are the Steps for Using the NABTEB E-Learning Portal. 1. Visit the NABTEB E-Learning portal i.e. http://www.nabtebelearning.org/ . 2. Sign-up free with your E-mail Address if you are visiting the portal for the first time, otherwise sign-in with your Email and Password. 3. If browsing from a laptop, on the top most right corner, click on the link with your name, then select Activate Account. But if you are browsing from a mobile device, select the menu box on the top left corner of the page, and select Activate Account. 4. Enter your PIN and Serial obtained during registration on the form displayed, and click the Activate Now button.